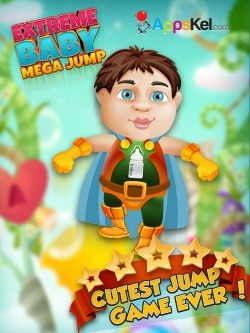 Click here to download Extreme Baby Mega Jump today! However, almost every night Willy dreams of being more than just a baby as he falls into deep sleep. He transforms into an amazing superhero that lives in a colorful world where he can eat all the candy and sweets that his heart desires! And it just so happens that the dream world where he goes to has amazing beanstalks that grow delicious peppermints, fruit-flavored hard candies, and more! 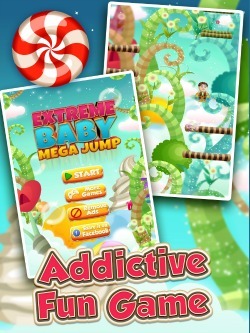 In Extreme Baby Mega Jump you must use your reflexes and skills to guide Willy up one of the many giant beanstalks where delicious candies await! 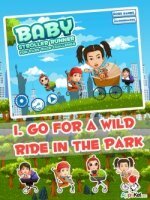 Move Willy left and right by tilting your device to bounce up the platforms and avoid falling off. These bouncy platforms not only come in different shapes and sizes but are also positioned in various parts of the screen, so you'll need to stay focuse and tilt with precision to succeed. 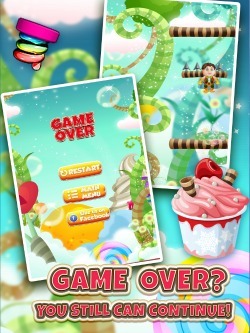 Just don't forget to collect all the different candies along the way to increase your score even more. You'll definitely need these if you want to have the best score possible, but remember that not all of them are easy to collect. Special spring power-ups also appear that give you a powerful boost jump when collected, increasing your score and helping you avoid any challenging obstacles. Also, don't forget that you can tilt Willy to the left of the screen to have him appear on the right-- and vice versa of course! Sounds pretty easy? That's because we haven't mentioned the dangerous spikes on some of the platforms that you'll definitely want to avoid! You also need to do your best not to fall off the bottom of the screen or else Willy will wake up and the dream will be over. Want to show off your incredible high score to your friends? Then use the in-app button to post your score on you Facebook page! This way you can conveniently share your score with others and challenge them to try and beat yours, all with a simple press of a button! Are you ready for a candy-filled adventure? 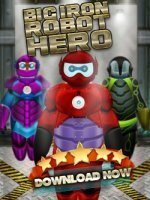 Then join Willy in his amazing superhero dream today-- for FREE! -Facebook integration to share your score with friends.